Having recently served as the first chairman of the 4A's from a non-traditional ad agency, I've often been asked to share my perspective on the agency business. During this transformational era, are there any basic differences between how ad agencies and other marketing agencies are moving forward in today's multiplatform communications world? What are the best approaches in how agencies are branding and positioning themselves to handle today's challenges? The short answer is, no matter what type of agency, it still comes down to addressing the basic question, "Who are you when you meet a client?" In a disappointing number of instances, the answer has become, "Whoever you need me to be." And that's the exact wrong answer if you want your agency to thrive. An agency is no place for wondering who you are, like Jason Bourne. Or obfuscating who you are, like Don Draper. And it's sure as hell no place for pulling a Jim Rockford. 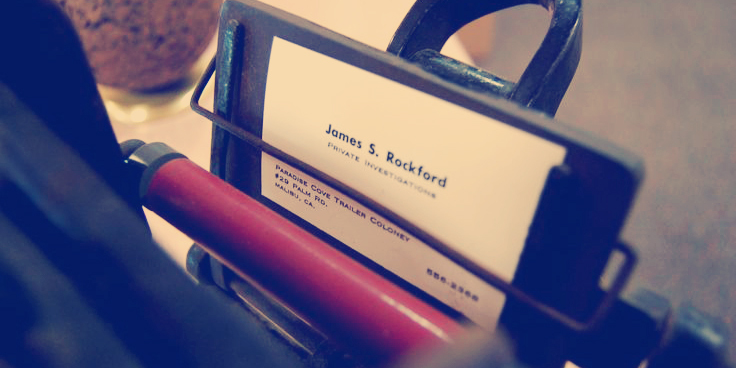 Jim Rockford (for those who only know streaming content, not dial-selected content) was a TV detective whose way of introducing himself was to print a fresh business card. He kept a tricky little instant printer in the back of his Firebird Sprint to create false identities wherever he was. He'd introduce himself as everything from a plumber to a publisher. Having multiple personas is good for a private detective, but not so good for agencies. Yet here we are in an industry where, in the name of growth, we brandish several business cards and titles in pitches, offering different values to perfectly fit client demands. But is the approach honest? Our ravenous need to grow has put us between a Rockford and a hard place. An agency needs to have a North Star -- a soundtrack and set of rules that can go unsaid because everyone at the shop knows what and who the hell they are. A place where if you ask the CMO or the intern what the agency is about, they all say the same thing, but each in his or her own way. A place with the focus of the Manhattan Project, the urgency of Lorne Michaels of Saturday Night Live, wrapped in an environment that possesses true empathy and a sense of humor. That focus and energy is even more vital when you're surrounded by constant change. Our industry is reinvented practically every day, and I certainly understand the need to continuously innovate. But while an agency's tactics should fluidly, strategically adapt to current challenges, its identity shouldn't. Tactics alone can't inspire a brand's character. Constant changing of tactics is pulling a Rockford. This "Rockfordization" of the industry (yes, I will trademark that phrase) impacts your long-term potential, dampening your ability to create a place that has the fire and firepower of talented people coming together to be part of something bigger, that matters more than just a bigger payday. This isn't advertising -- it's human nature. It is not just a "best practice"-- it's the only reason any agency has ever worked or will work. Agency brands matter because you can create the most valuable property imaginable -- an experience people want to be a part of. People value experiences, and shared experiences are the best kind. We only truly thrive when we share in the act of doing, seeing and creating. And the field of advertising has an open invitation to huddle up with a bunch of unlike-minded people and do, see and create. You want an agency brand with employees saying, "I was there when..." and having reunions in 20 years because the memories they shared are so powerful they must be relived. Everyone knows in our industry talent is it. Talent is the thing. Talent is the moth and your agency brand is the flame. Client brands are built on agency creativity. And agency brands matter because when they're strong, talent finds you. Know the difference between recruiting and evaluating. Always seeking to fill slots will never keep an agency thriving with the best people. You need an agency brand that has the gravitational pull of Jupiter upon talent -- a brand that then has clients unable to resist that pull. I liked the Rockford Files, but I have just one card. (David Ogilvy did, too.) Mine says, "Chris Weil, Momentum Worldwide." My goal is that every person who shares this brand with me or is handed this card knows exactly the experience they're in for. Because it's the only card they're going to get from me. And it's the only way you can honestly grow.